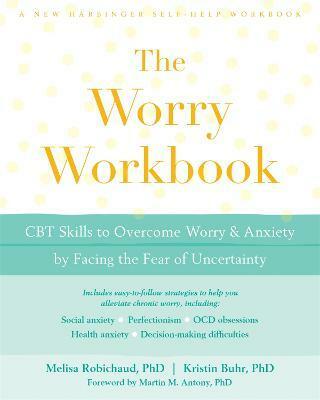 Written by two psychologists and experts in anxiety, The Worry Workbook provides powerful, evidence based tips and tools to help you challenge your fears, build a tolerance for uncertainty, and find relief from worry. Are you plagued by persistent worry? Do you have trouble making everyday decisions? Are you a perfectionist exhausted from trying to meet unreasonably high standards? Do you procrastinate important tasks? All of these problems could be caused by the same thing: an intolerance for uncertainty in the face of new challenges or unpredictable outcomes. Everyone worries from time to time-it's unavoidable. But chronic worrying, anxiety, and fear can also take a hefty toll on your health, happiness, and relationships. If you're someone who worries about what might happen if you try something new, you aren't alone! Many people lose sleep over "what ifs"-leading to difficulty making decisions, avoiding new situations, trouble with relationships, and missing out on life's adventures! So, how can you overcome this fear and start living your best life? While there are many self-help books and workbooks that tackle worry and anxiety, The Worry Workbook is the first to provide guidance for overcoming the fear of uncertainty. With this guide, you'll find concrete exercises and step-by-step instructions to help you identify your fear of uncertainty-whatever it is-and challenge it using powerful cognitive behavioral therapy (CBT) practices like self-assessment, self-monitoring, and behavioral experiments. Chronic worrying can affect all aspects of your life. This book will help you target your fears and worries, tolerate uncertainty, and trust your own judgment and abilities in the face of doubt. "Why do some people worry more than others? In this book, Melisa Robichaud and Kristin Buhr present a clear and simple explanation of worry. Their theory is based on twenty-five years of research on worry, anxiety, and intolerance of uncertainty. To my knowledge, this is the first self-help book to systematically address the relationships between uncertainty, perfectionism, and problem solving, and to do so without referring to a particular mental health problem. Moreover, Robichaud and Buhr present well-defined and concrete self-help strategies that are closely tied to recent theories of learning. By pointing out the key role of safety behaviors in worry, they have really 'hit the nail on the head.' If you are someone who struggles with worry, it is almost impossible that you will not benefit from the countless examples of self-help strategies listed in this book." --Michel Dugas, PhD, clinical psychologist and professor of psychology at the Universit du Qu bec en Outaouais--Michel Dugas, PhD "Finally! A self-help book targeting intolerance of uncertainty as a central focus. Melisa Robichaud and Kristin Buhr have written a comprehensive guide for managing problematic worry of any type or intensity. ... Throughout the book, the reader will find: information that is educational and corrective of myths; self-monitoring exercises to increase awareness of triggers and problematic patterns of thinking and acting; self-assessments to identify one's 'worry fingerprint, ' idiosyncratic areas of tolerance of uncertainty, safety behaviors, etc. ; and sample behavior experiments for targeting different worry types, perfectionism worries, decision-making, and disorder-specific worries. ... After reading it, I am certain that it will quickly become a go-to resource for worriers and the professionals who treat them." --Simon A. Rego, PsyD, ABPP, chief psychologist at Montefiore Medical Center, and associate professor of psychiatry and behavioral sciences at Albert Einstein College of Medicine in New York, NY--Simon A. Rego, PsyD, ABPP "The Worry Workbook is superb! Whether you wrestle with worry episodically or are gripped with intense and frequent anxiety, this book will help you identify and change the core beliefs and fundamental behaviors that reinforce and intensify worry and anxiety. Robichaud and Buhr provide an outstanding and practical step-by-step guide to understanding and overcoming worry, utilizing scientifically proven techniques and strategies. The workbook is reader-friendly, highly engaging, and easy to understand and use--the techniques presented in this book could dramatically change your life. I will recommend this book to my clients, and to students and professionals." --David J. A. Dozois, PhD, professor and director of the clinical psychology graduate program in the department of psychology at University of Western Ontario--David J. A. Dozois, PhD "Drawn from strong scientific foundations, The Worry Workbook is a straightforward yet compelling tool for those suffering with worry and chronic anxiety. In prescribing experiments that paradoxically embrace uncertainty, Robichaud and Buhr provide a blueprint towards combating safety behaviors and promoting a fuller and more enriching life despite unpredictability in the world." --Douglas Mennin, PhD, professor in the department of counseling and clinical psychology at Teachers College, Columbia University--Douglas Mennin, PhD "Most people worry from time to time. But for some, worry is a constant companion. It makes mountains out of molehills. It screams 'catastrophe!' where others seem to brush things off. It turns simple matters into agonizing predicaments, keeps you up at night when others are soundly asleep, and turns a relaxing day into knotted muscles. But is does not have to be this way. Robichaud and Buhr take decades of the leading research and clinical insights, and present them in a clear, easy-to-understand program to help you understand and overcome your anxiety. Don't worry!" --Peter Norton, PhD, professor of clinical psychology at Monash University in Australia, and director of the Monash FEAR Clinic--Peter Norton, PhD "This book will be a truly helpful resource for those who struggle with worry. Written by two seasoned experts on the topic in clear and practical terms, The Worry Workbook will guide you through a series of therapeutic exercises based in the latest theory and science of worry and anxiety. It is a book for doing, rather than just for reading; but it's one that promises to provide relief from worry and anxiety to those who need it most." Melisa Robichaud, PhD, is a clinical psychologist and cofounder of the Vancouver CBT Centre. She holds adjunct clinical faculty and clinical associate positions in psychology and psychiatry at the University of British Columbia and Simon Fraser University. Robichaud specializes in the treatment of anxiety with an emphasis on generalized anxiety disorder (GAD), and is on the scientific advisory board of AnxietyBC. For over a decade, she has provided workshops and training to both mental health professionals and the public on the treatment of GAD, and has published numerous book chapters and scientific articles on the subject. Kristin Buhr, PhD, is a registered psychologist and director at the North Shore Stress and Anxiety Clinic in North Vancouver, BC. She is a lead consultant for AnxietyBC, where she has developed numerous self help resources for adults, parents, and teens coping with worry and anxiety, including MindShift, an anxiety management app for youth and young adults. Buhr specializes in the evidence-based treatment of anxiety and mood disorders in adolescents and adults, and regularly provides educational workshops on mental health issues. Martin M. Antony, PhD, is professor and chair in the department of psychology at Ryerson University in Toronto, Ontario. He is director of research at the Anxiety Treatment and Research Clinic at St. Joseph's Healthcare in Hamilton, Ontario, and past president of the Canadian Psychological Association. An award-winning researcher, Antony has been widely quoted in the American and Canadian media. His research, writing, and clinical practice focus on cognitive behavioral therapy (CBT) and the treatment of anxiety disorders. Antony is coauthor of The Shyness and Social Anxiety Workbook, When Perfect Isn't Good Enough, and more than twenty-five other books.